Upon taking office, German Chancellor Angela Merkel (CDU) decided to make "a pact with America the cornerstone of her foreign policy," reorienting Germany away from Russia and back towards the United States. This pact has become increasingly tenuous after the election of Donald Trump as this year's Berlin Foreign Policy Forum demonstrated. 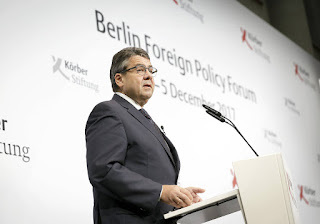 The Berlin Foreign Policy Forum is an annual event hosted by the Körber Foundation in cooperation with Germany's Federal Foreign Office, bringing together politicians, government representatives, foreign policy experts and journalists to discuss German foreign policy and Germany's role in the world. German Foreign Minister Sigmar Gabriel (SPD) opened this year's forum with an unprecedented attack on Merkel's pact with America, telling the audience: "Germany cannot afford to wait for decisions from Washington, or to merely react to them. We must lay out our own position and make clear to our allies where the limits of our solidarity are reached." This article was published on December 7, but I forgot to share it here.